All transactions are safe and secure with a reliable history in online purchasing behind each of our associates. 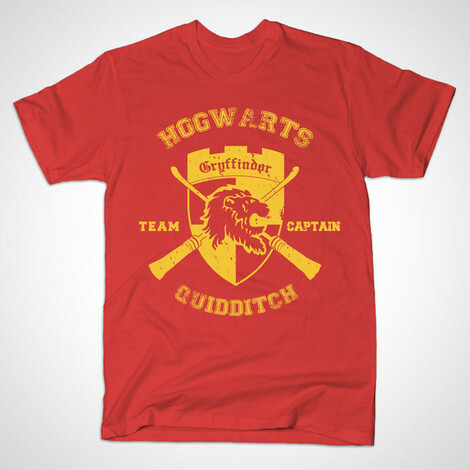 Buy the Harry Potter Gryffindor Quidditch t-shirt to own Harry Potter clothing and merchandise. Wear this Harry Potter Gryffindor Quidditch shirt to show your support for the best player in the sky. Choose from a variety of apparel styles. For the perfect costume, combine the jersey with a Harry Potter broom and you'll be ready for a game of Quidditch. The broomstick is available at the bottom of the gallery. This piece of Harry Potter merchandise is a great start to creating the perfect HP costume. Order yours today along with a wand and a Harry Potter sorting hat. The Nimbus 2000 Broom will help you catch the Quidditch Golden Snitch. In addition to the Harry Potter Gryffindor Quidditch tee above, browse the Harry Potter Clothing Gallery for more apparel like men's and women's clothes, kids shirts or hoodies.